Love this anytime.. Delicioucs breakfast will all those toppings!! Whole wheat pancakes look awesome ! With a bit of chocolate and those toppings I bet any kid would love it , great idea to freeze for those busy days ! Wish i get that plate rite now and those chocolate chips makes those eggless pancakes more delicious and prefect to serve for kids. Often make this whole wheat pancakes for breakfast. Yeah,the buttermilk really gives softness to the pancake and doesn't make you miss the eggs in the pancakes. Great share !!! The pancakes look soft and fluffy and the toppings look like a delicious combo to the pancakes.. Delicious looking wholewheat pancakes. Adding chocolate chips makes them extra special. My kids will devour these in no time. Such a fantastic eggless pancake Harini. I mostly make the same way with all purpose flour, will have to try the wheat flour next time..my kids love it too! Delicious pancakes...I somehow prefer wholewheat ones over the plain ones. Wholewheat pancakes taste nutty and earthy. Whole wheat pancake came out so soft and spongy, must have tasted just delicious for a filling breakfast. I am drooling over that stack of pancakes and how wonderful it looks with the wheat flour. I personally love the flavor of whole wheat. My husband though is not a big fan. I end up mixing APF and whole wheat flour to please both of us. pancakes looks so tasty and chocolate makes me hungry. 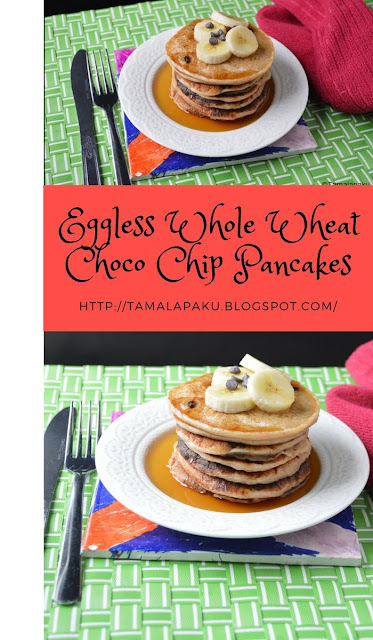 I once made these eggless choco chip pancakes for another event and my kids went crazy over it. You pancakes looks so inviting Harini. That looks inviting harini, to wake up to some warm pancakes drizzled with syrup and bananas is bliss!!! a warm, cozy and comforting breakfast!! !